Online travel website, mybudgetbreak, has announced it is planning on launching its own range of cheap short breaks in 2014. The news was welcomed by the team as they look to grow in the ever competitive travel industry. Started in 2012, mybudgetbreak has focused its attention on helping the public to get away on their holidays as much as they can. The site was started because of the lack of 'real' holidays that were available on travel websites. Up until now, mybudgetbreak has focused its attention on hunting through the vast amounts of short breaks available via other travel companies, along with offering competitions to win travel vouchers, again focusing on the ability to get away on the cheap. From day trips in France to Summer holidays in the Med, mybudgetbreak has helped people on a budget getaway through its partner travel companies. The national airline of Qatar, Qatar Airways, has announced it will join the One World Alliance on 30th October 2013. The announcement comes after a series of talks as the first of the three big Middle Eastern airlines look to join an alliance. Qatar Airways will also align its frequent flyer programme with British Airways’ Executive Club and American Airlines’ AAdvantage programmes which will allow passengers to collect and spend miles on each other’s flights. It's been five years since the High Speed California Rail Link was first announced and despite positivity and support, the project is still running into problems. The most recent was a ruling that stated the agency in charge of the rail link had not fulfilled it's financial and environmental policies that were promised at the initial funding stage of the project. Whatever happens, there seems to be a number of people determined not to get the project underway. The project is expected to be completed by 2029 and will offer travellers journey times between Los Angeles and San Francisco of less than three hours. Approval for the construction of the link took place in July 2012 and is expected to cost almost $10 billion. Whilst this goes on, Jump Start Fund, a crowdfunding type group has announced that they will aim to deliver the Hyperloop, designed by American entrepreneur Elon Musk, who decided he didn't have enough time to follow the idea from concept to creation. Musk claims that his highspeed line will transport passengers from San Francisco to Los Angeles in a mere 30 minutes, much less than the high speed line expected from the High Speed California Rail Link. Research will continue into the Hyperloop and it's feasibility possibly causing the original rali link to be defunct, even before the first service commences. The future commute - a flying bicycle? Duratec, a Czech bicycle manufacturer has released details of what their future bikes may look like. Working together with software and technology company Technodat and Evektor, a light sports aircraft manufacturer both based out of the Czech Republic, Duratec have revealed the F-Bike. Etihad to invest in Jat Airways? Yesterday saw the announcement by Etihad Airways, national airline of the United Arab Emirates, of a potential investment in struggling Serbian carrier Jat Airways. 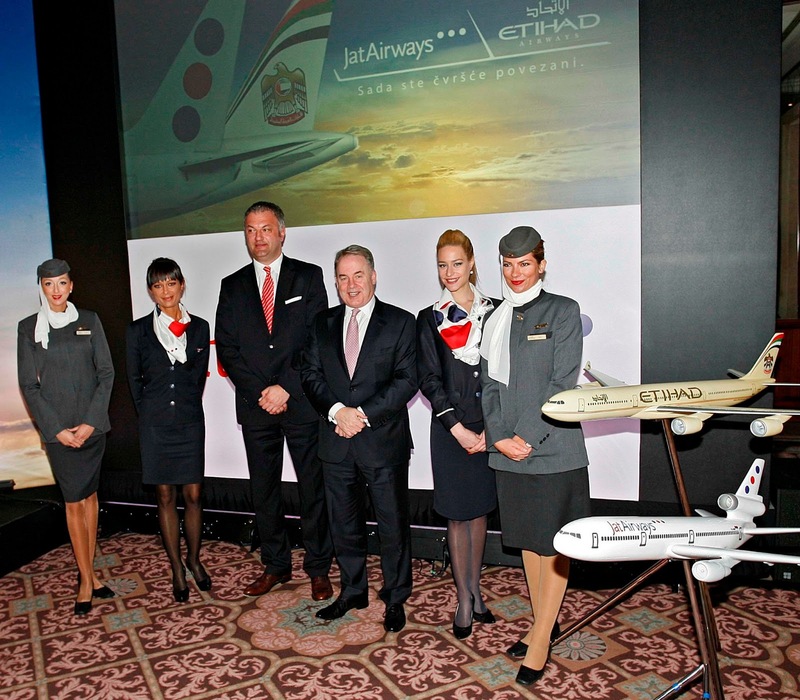 Following the launch of Etihad’s daily service to Belgrade which allows Jat Airways to put its JU airline code on the Etihad flight will connect passengers in Serbia with a number of worldwide destinations, including Australia, Asia and the Middle East. Australia is renowned for its sunshine and relaxed way of life and sport plays a huge part of this. Whether it’s learning to surf on one of Australia’s many beaches, taking in the atmosphere at the Melbourne Cup or enjoying some exciting Aussie rules football, sport plays an important role in Australian society. Every November, Melbourne plays host to one of the most exhilarating sporting events, the infamous Melbourne Cup. Attracting all sorts including worldwide celebrities, the Melbourne Cup is not just a sporting event, it’s the place to be seen in Melbourne. 2012 saw the likes of Mischa Barton, Delta Goodrem and Prince Charles attend the annual gathering, adding to the excitement around the event. And this years, cup is set to be even more exciting. The 153rd Melbourne Cup Carnival winner is set to bag yet another extravagant prize. With just a few weeks to go until entries for the race close, up to 400 horses are expected to be nominated for the event. Off the track though, the atmosphere is truly electric. No matter which option of hospitality you choose, whether it be access to the village, track side viewing or a giant marquee, the week is always magical. This year’s main event will be held on Tuesday 5th November and will be held once again by Emirates, one of the largest airlines in the world. As part of the special occasion, Emirates will be flying the iconic 18 carat gold Melbourne Cup around Australasia including Brisbane, Canberra, Sydney, Hobart and taking in community events and cocktail parties. Held at Flemington Race Course, just north-west of the city centre, the 2013 Melbourne Cup will once again attract visitors from far and wide, both in Australia and internationally. Booking packages to the event is easy, although book early has hotels can get busy very quickly. Located at the eastern side of the Mediterranean Sea lies the beautiful country of Turkey, famous for its rich cultural heritage, striking scenery, the Blue Mosque and of course, Turkish Baths. But fly to Istanbul, the country’s largest city and you will find a wealth of attractions and events to entertain you. Despite not being Turkey’s capital city, Istanbul does boast over 13 million citizens, making it the largest in the country. It also sits on one of the world’s busiest waterways between the Black Sea and the Sea of Marmara which was an important historical trade route. Made up of 39 districts, each offers an insight into Istanbul’s long history, such as Yali which plays host to a wealth of luxury houses and mansions. The architecture in Istanbul is what really sets the city apart from others. The Hagia Sophia is the perfect example of such exquisite architecture. Once a church, then a mosque and now a museum, the Hagia Sophia was built in 537 and stands proudly in the heart of the city centre. If it’s the local cuisine you have come to taste, being a seaside city means Istanbul offers countless delicious seafood restaurants along it’s coastline. Poseidon, is a must for seafood lovers with its exquisite cuisine and beautiful views across the bay, Poseidon is a favourite amongst both locals and visitors. What are your recommendations for this impressive city? 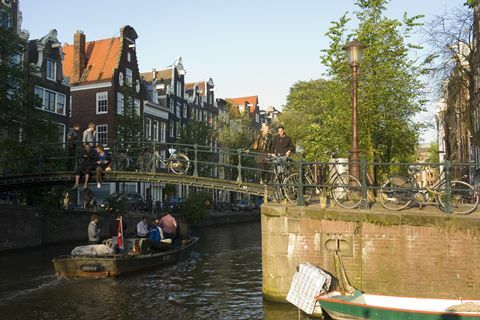 The stunning city of Amsterdam is hundreds of years old, steeped in history and culture, full of unusual architecture and offers a host of activities to visitors. With the launch of Etihad’s new service to Amsterdam from Abu Dhabi, we’re looking at what to do in the city. Did you know that LinkedIn has more than 150 million users around the world? It’s pretty much emerged as the ultimate website for professional networking. With that amazing growth – and the fact that most users (51%) have between 0-500 direct connections – the only concern is information overload. Keeping track of your connections isn’t easy… or at least, it hasn’t been easy until now! Etihad Airways, national airline of the United Arab Emirates has launched its new Linkedin ‘Mapped-Out’ app allowing Linkedin users to find their connections on a global scale. 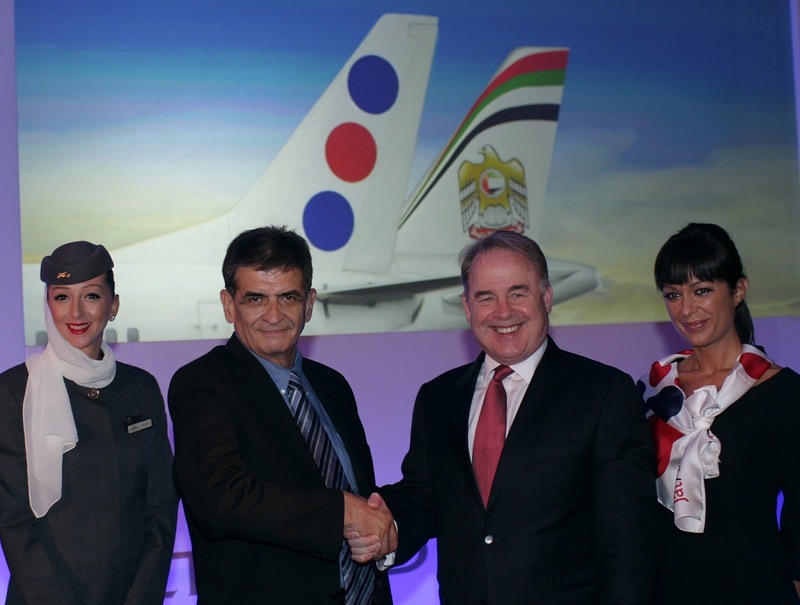 In a move that grows its ever-expanding route network, Etihad Airways has announced a further two destinations, totaling six for 2013. The two new destinations announced within a day of each other are Serbia’s capital city Belgrade, due to start on 15th June and Sana’a in Yemen, due to start on 1st September 2013. Adding to Etihad Airways’ growing success, the Abu Dhabi based airline has formed a cooperation initiative between its cargo division and KLM cargo which adds one of KLMs Boeing 747 freighter aircraft to Etihad Cargo’s fleet. Photo caption: (from left to right): KLM Managing Director and Chief Operating Officer Pieter Elbers, KLM Managing Director and EVP Air France-KLM Cargo Camiel Eurlings, Etihad Airways Chief Strategy and Planning Officer Kevin Knight, Etihad Airways Vice President Cargo David Kerr. The additional aircraft will link Abu Dhabi and Amsterdam, as well as increasing capacity to Frankfurt, Hong Kong and Dhaka, using the jumbo jet with a payload capacity of 124 tons. The Boeing 747-400 ERF delivery in late March will increase Etihad Cargo’s fleet to seven aircraft allowing Etihad to grow its successful cargo division. The news comes in the wake of the Air France-KLM group announcing its 2012 financial results who blamed increasing fuel charges and trouble with its cargo divisions. With a restructuring of the company imminent, the move, offering the KLM freighter aircraft as part of the agreement between the two airlines, seems to be a good option. Three further freighters are schedule to be delivered direct from the manufacturers during 2013 and 2014, one Boeing 777F and Airbus A330-200F. In January, the world’s fastest growing airline, announced it would offer daily flights between Abu Dhabi and Amsterdam from May onwards, connecting the Dutch capital to popular destinations such as Thailand, Australia and Pakistan. 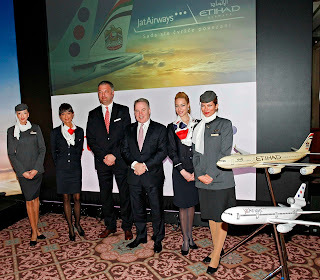 The world’s fastest growing commercial airline, Etihad Airways, has announced some outstanding financial results today, just weeks before it progresses further into the future with its new website and booking engine. Announcing a US$42 million profit in 2012, Etihad has seen a 200% increase on 2011, explaining innovative thinking and outstanding service has been a key contributor to the airline’s success. It’s been a long time since we posted and with all this snow around in the UK, I wanted to chat about favourite snowy destinations. You know the ones. When you wrap up warm in your hat and gloves and go out in the evening with the snow on the ground, crunching underneath your feet, and the lights of the city sparkling at you.